As we saw in Issues one and two of the e-magazine, Japan has many days of celebration and remembrance enshrined in law, each of which reveals something of Japanese culture and history, and indeed of its psyche. In this issue we look at the holidays in April and May, including the cluster of non-working days in early May known as Golden Week that is followed by a long period – by Japanese standards – with no holiday at all. Consequently a seasonal ailment called ‘Gogatsu-byō’, literally ‘May sickness’, affects many Japanese who are depressed about returning to the working routine once Golden Week is over, for there are no holidays at all to look forward to in June. I wonder how many British people know George VI’s birth date? In Japan the birthday of the current Emperor’s late father is universally remembered, because it heralds the longed-for start of Golden Week. The Shōwa Emperor (Hirohito) was born on 29 April 1901 and died on 7 January 1989. His long reign from 1926 to 1989 saw World War II, post war Allied occupation and then Japan’s rise as a formidable industrial and economic world power. 29 April was designated a national holiday during his reign, and after his death it continued to be observed under the name ‘Greenery Day’, while a series of failed legislative attempts were made to reinstate 29 April as a commemorative day for Hirohito. Eventually in 2007 a law was passed to name 29 April officially as ‘Shōwa Day’. This national holiday was established in 1948 to commemorate the day in 1947 when Japan’s postwar constitution came into effect. The Postwar Constitution, also known as the Peace Constitution, was drawn up under the Allied occupation that succeeded WWII and contains three pillars: sovereignty of the people; respect for fundamental human rights; and pacifism. Avid readers of this column may recall that there is another national holiday celebrating Japan’s constitution, namely Culture Day on 3 November, which commemorates the day in 1946 when the constitution was announced. The fact that the constitution features as a reason for two national holidays shows how much it means to the people of modern Japan. 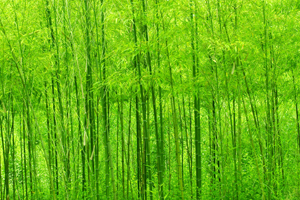 Greenery Day was established after the Shôwa Emperor’s death in 1989 as a way of keeping a national holiday on his birthday, and until 2006 it was always celebrated on 29 April. Its name is said to stem from the Shôwa Emperor’s love of plants. When Shôwa Day was officially recognized in 2007, Greenery Day was shifted to 4 May so that people could enjoy consecutive holidays. Before that, when I was growing up, 4 May was a normal school day sandwiched between the two national holidays of Constitution Memorial Day and Children’s Day. 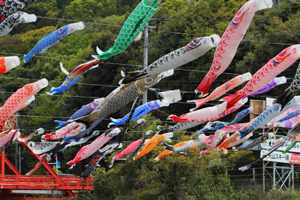 A school of koinobori (carp windsocks) flying above rooftops. Traditionally known as ‘Tango no sekku’ (Boys’ Day) , Children’s Day was originally celebrated on the 5th day of the 5th moon in the lunar calendar. ‘Tango no sekku’ was, until recently (and in principle still is), celebrated as Boys’ Day. Families with boys raise koinobori (carp-shaped streamers), display kabuto, a traditional Japanese military helmet, and wish for the boys’ health and development. Girls’ Day on 3 March (incidentally the birthday of the Institute’s founder Lady Lisa Sainsbury) is not designated as a national holiday. ‘Tango no sekku’, or Boys’ Day, became Children’s Day when it was established as a national holiday in 1948. As a schoolgirl I used to feel a tinge of sadness on 5 May because it marked the end of Golden Week, and that meant no more days off until the summer holidays. *Quotes on each national holiday defined in Public Holiday Law of 1948 Act 2 have been translated by Nishioka Keiko.